This recipe for Crowd Pleasing Crustless Vegetable Quiche is as easy to make as it is delicious. Packed with vibrant vegetables and savory shredded cheese, it’s a recipe worthy of a special occasion or a lazy Sunday morning brunch with family. Thank you so much to ALDI for sponsoring this post! Whenever my extended family gets together for a party or a special event of some kind, I always seem to walk away with a handful of recipes I want to make again at home. We’re a family who loves to eat and I know I can always count on my Aunt Laurie for amazing crowd-pleasing recipes. She’s a social butterfly who constantly seems to be hosting some kind of a gathering in her home, whether it be something casual like a small group meeting of couples from her church or something a little more involved like a baby shower or holiday party. During the hybrid baby shower/baby sprinkle my Aunt Laurie hosted for me and my sister back in April, the food we ate all weekend was fantastic. A few standouts stole the show for me and I quickly found myself requesting recipes to take home with me to make again for our family and friends. This crowd pleasing crustless vegetable quiche is one of them! Made with fresh vegetables, eggs and cheese, it’s an easy recipe to make and one that’s simple enough to whip up on a lazy Saturday morning but delicious enough to save for a special occasion brunch. I switched things up a little bit from my Aunt Laurie’s original recipe and my version incorporates a few more veggies, spices and eggs but it’s still just as vibrant and fluffy as the original. To make this quiche, I first swung by ALDI to stock up on an assortment of organic produce, organic cage free brown eggs, pink Himalayan salt, organic cayenne pepper and their new organic shredded cheese and organic almond milk products. By now you guys know I am an ALDI super fan because of the store’s unbelievably low prices on organic fruits and vegetables (you simply cannot beat them in our area) and I feel like every time I pop into ALDI, I’m finding a new healthy item to grab for our family to try. 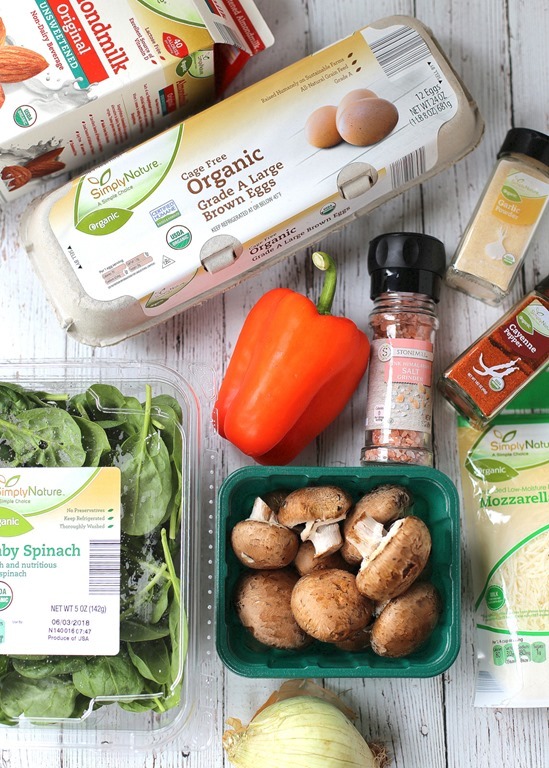 In addition to organic produce, I’m constantly adding items from the SimplyNature line of products at ALDI, made without any artificial flavorings or colors, to my cart. I love seeing the selection of organic options at ALDI grow and grow. ALDI also recently expanded their everyday product selection to feature a wider variety of choices, including everything from milk alternatives (like SimplyNature Organic Almond Milk) and fresh butternut squash or zucchini noodles to quinoa bowls and organic cheese offerings like the SimplyNature Organic Mozzarella Shredded Cheese I used in this quiche. Oh and Chase is still 100 percent obsessed with SimplyNature Organic Shells & White Cheddar Macaroni and Cheese. I should probably just go ahead and buy that stuff by the case. But back to the quiche! Once I had everything I needed to make this crustless vegetable quiche, the recipe came together in a flash. If you are hoping to make this quiche to feed a crowd, the first few steps can be prepped ahead of time. It’s a great recipe to partially make before guests arrive or wake up in the morning because once the vegetables are sautéed and the egg mixture is ready, all you have to do is pour it into a pie dish and allow it to bake in the oven for 45 minutes. My advice: Prep the veggies and combine them with the cheese and eggs and cover it up the night before you want to make it, that way you can simply pour everything into a pie dish and enjoy slowly sipping your hot coffee or tea with family and friends while breakfast bakes away and makes your kitchen smell heavenly! Packed with vibrant vegetables and savory shredded cheese, this vegetable quiche is a recipe worthy of a special occasion or a lazy Sunday morning brunch with family. Sauté onion, bell pepper, mushrooms and spinach in butter over medium heat until onion is soft and translucent and spinach is fully wilted. While the vegetables cook, toss cheese and flour together. Combine eggs, almondmilk, salt, pepper, garlic powder and cayenne pepper together. Add cheese and vegetables to egg mixture and stir thoroughly to combine. Pour into a pie dish sprayed with cooking spray, sprinkle with additional salt and pepper and bake for 45-50 minutes. 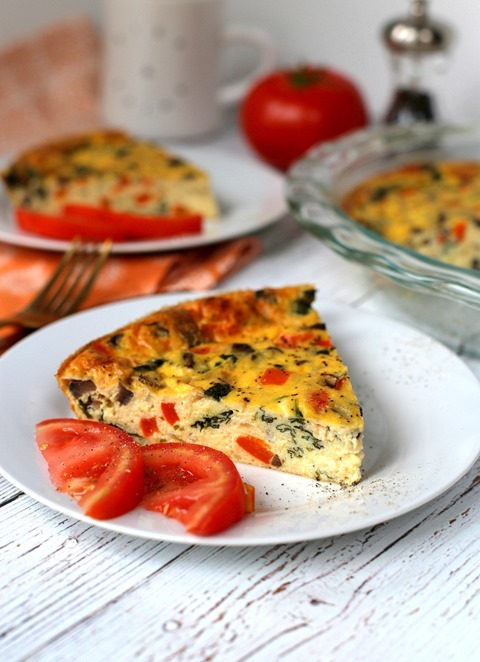 Allow quiche to rest for 30-45 minutes before slicing and serving. This is another recipe that can be easily adapted to your personal tastes and can help use up whatever vegetables you may have on hand. 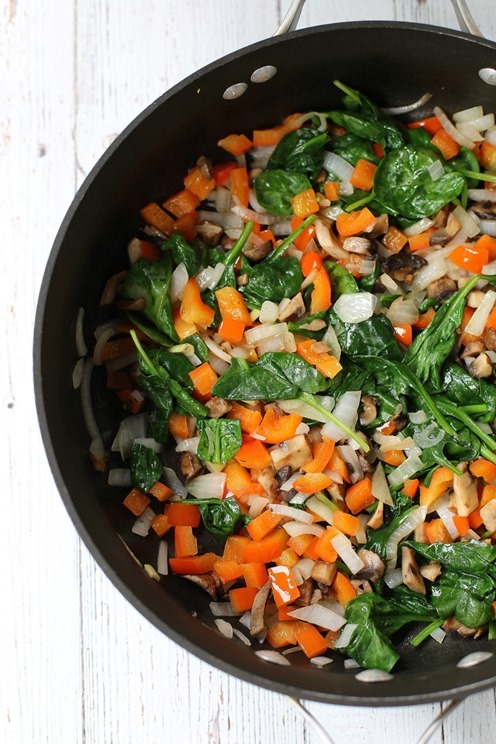 Consider adding chopped broccoli or kale in place of the spinach. Use your favorite cheese in place of the shredded mozzarella or Mexican cheese. 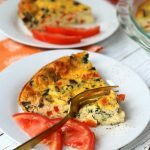 (I love this quiche with a sharp cheddar cheese and you can easily find a ton of different deliciously creamy cheeses at ALDI, including Mild Cheddar, Colby Jack, Italian Blend, Taco Style, etc.!) If you make any swaps you end up loving, please let me know so I can give them a try in the future! What is one of your favorite go-to recipes to make if you’re going to whip up something delicious for brunch? Yum, I love a good quiche. Some of my favorite brunch recipes are mini crustless spinach quiches (perfect for little hands 🙂 ), a big fruit salad, scones with jam & cream, and egg in a hole. My love for ALDI is strong but my love for quiche is stronger!! Drooling over this this morning!! YUM! This sounds awesome! I love quiches as a way to use up veggies in the fridge. Me too! 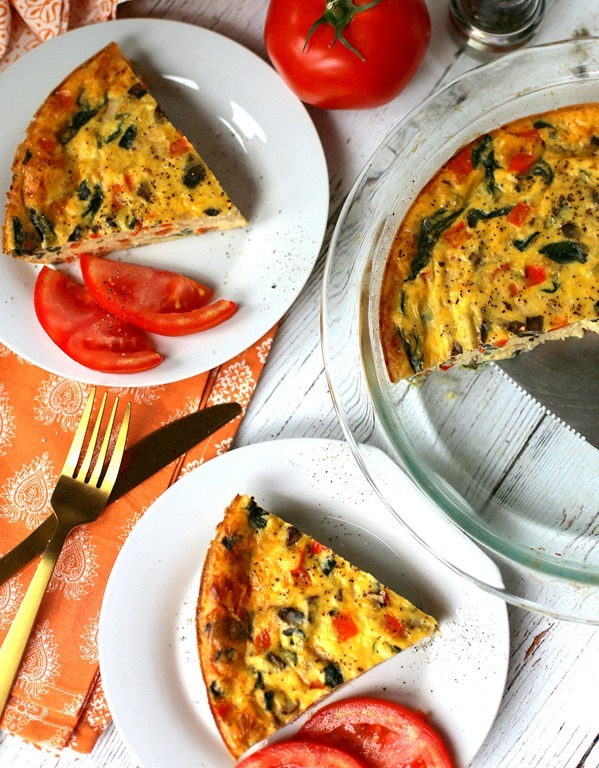 Egg scrambles, quiches and fritaatas are such a good way to salvage any veggies that may be on their last leg. Yum!!! I love quiche! Maybe I’ll finally get around to making some using your recipe? I love Aldi! I need to pick up the ingredients for this recipe!! Seems like a perfect quick dinner! This sounds delicious! Question, why toss the cheese with flour? Do you know some special quiche trick I don’t know?? This looks fabulous! Can’t wait to try it. Our stores all just got remodeled and are fabulous! I turned my nose up at Aldi for years but a friend pushed me to give it a try & now I feel a little off balance if I’m not there every Sunday. 🙂 Can’t wait to give this a try! I can NEVER get my quiches to be as fluffy as this looks! Or as the one from Wegman’s is haha! Do you use a whisk?? 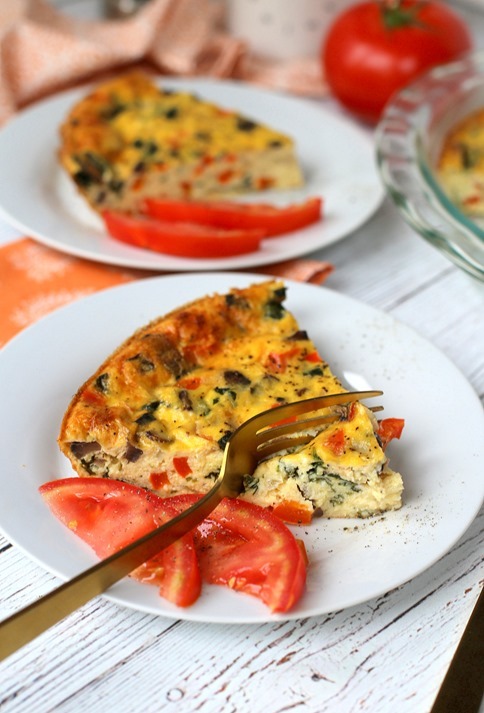 A crust less quiche is called a frittata… looks good though! Just made this and it’s delicious and easy! I added some susage for extra protein and I was pleasantly surprised to not miss the crust as much as I thought I would. Thanks Julie! I’m so glad to hear your liked it!!! Thanks for taking the time to report back and let me know, Liz! My mother used to make frittatas for a Sunday family breakfast alongside almond coconut pancakes and fruit salads. They were so delicious! I don’t eat eggs anymore, but this brought back some good memories of those days! I would love to make a chickpea quiche one day, or a tofu quiche! You can’t go wrong with such a crowd-pleasing recipe like this! I just made it and it’s wonderful! I used dairy milk and white cheddar cheese in mine. It fluffed up so well! Is the flour on the cheese to keep it from all sticking together? I’ve never done that before. Hi Julie: This recipe is a winner! I have made it numerous times since this posting with my CSA vegetables. Thank you for sharing your great recipes :). I’m so glad you liked it!! Thanks so much for taking the time to comment back here and let me know! Can you make this WITH a crust? Is that a dumb question?